← Is Putin like Hitler? This week I’ve had the pleasure of giving two guided tours to Bruce and Heidi from Denver, Colorado. They are a really nice couple and extremely interested in their history and all things British. Our walking tour of London was at times in danger of becoming a swimming tour of London and as it has now rained hard for 7 days in a row, we were all a little concerned about our tour yesterday to Stonehenge. However, we needn’t have worried. Everything ran perfectly and I discovered a new and quicker route for my drive into central London too. I collected them at their very nice hotel, The Chesterfield Mayfair, just a short walk from Green Park and after weaving through the Hyde Park traffic we were soon on our way past Harrods, Heathrow and the dreaded M25 without any problem whatsoever. What’s more, we left behind the torrential rain in the London area and as we drove westwards the skies didn’t just lighten but there were little patches of blue sky. This might sound funny that we have little patches of blue sky whereas in many places the sky just has little patches of cloud. Nevertheless the drive down the M3 and then A303 went quickly with lots to look at with the crops in the fields growing and the trees in leaf. There were plenty of cows, sheep and pigs around too which my two guests seemed delighted to see. Stonehenge is about 80 miles west of London and lies on Salisbury Plain which is a vast grassland much of which is owned by the Ministry of Defence who have used it especially for their tanks since WW2. Strangely, the fact that so much land is under military control has helped conserve its beauty and in many areas helped improve the wild-life too. 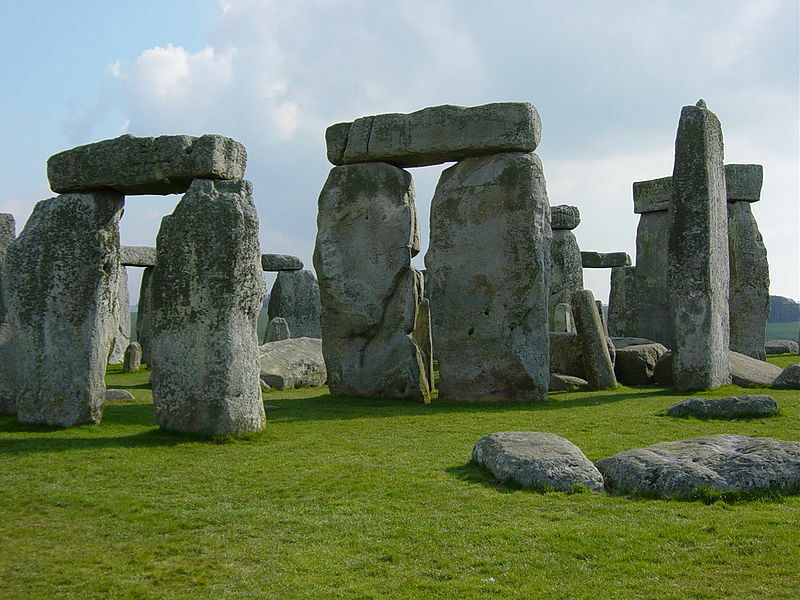 Stonehenge was established in 3,000 B.C. according to the t-shirts at the visitor centre and as a wonder of the world has been attracting visitors since at least Roman times and now attracts over 1 million people every year. There are actually over 1,000 stone circles in the British Isles as well as a few in France as well. They were built by the neolithic peoples who tamed Britain and began clearing away the forests that covered the land. Despite Stonehenge not being my favourite stone-circle it has an unmistakable presence. Recently millions of pounds have been spent on a new visitors centre as well as removing one of the two roads that are near the UNESCO World Heritage Site. Much debate continues on building to hide the remaining busy road by placing it in a tunnel with the only thing as usual that stops it being money. This was my first time to the new visitors centre and it is a vast improvement on the old one. 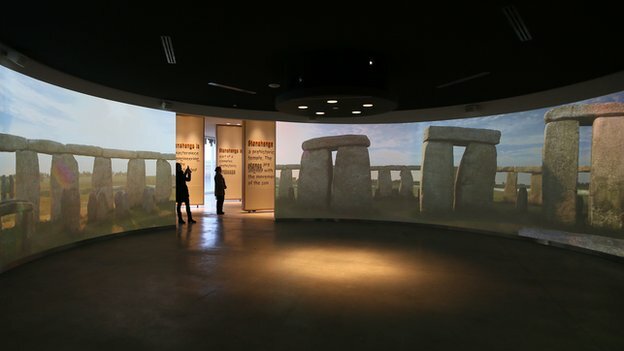 Several artefacts on display along with a large 360 degree video screen of views inside Stonehenge at different times of the day and year. There is also a neat video wall showing how the area has changed through the millennia. The stones were excavated in south-west Wales, a distance of 175-200 miles away with each individual stone weighing up to around 50 tonnes. Stonehenge itself is just part of a bigger neolithic landscape, some of it such as the small barrows or hills can be easily seen and others only noticed by looking very carefully, preferably from the air. There remains much that is unknown about Stonehenge and at various times it seems to have been used as a calendar, religious centre, burial ground and numerous other things. Though at times, it can be very busy, it is still easy to let your imagination run wild at Stonehenge. I always imagine woolly mammoths running around the chalk grasslands and think of my ancestors that may have stood on this very spot 5,000 years ago. Stonehenge – The view of the circle is different from every angle, at every time of the day and in all the seasons too. Stonehenge has always inspired artists and writers but at the beginning of modern times, many of the stones had fallen over or been removed and even after they were restored, it was still possible for visitors to go inside the stones and sometimes vandalise them. In the 1980’s there were huge battles between hippie type people and the police around the summer solstice where everyone was banned from the stones but now a compromise has been reached with the druid priests being allowed to practice their ancient religion on the summer and winter solstices in a similar style to what many believe the original builders did millennia ago. 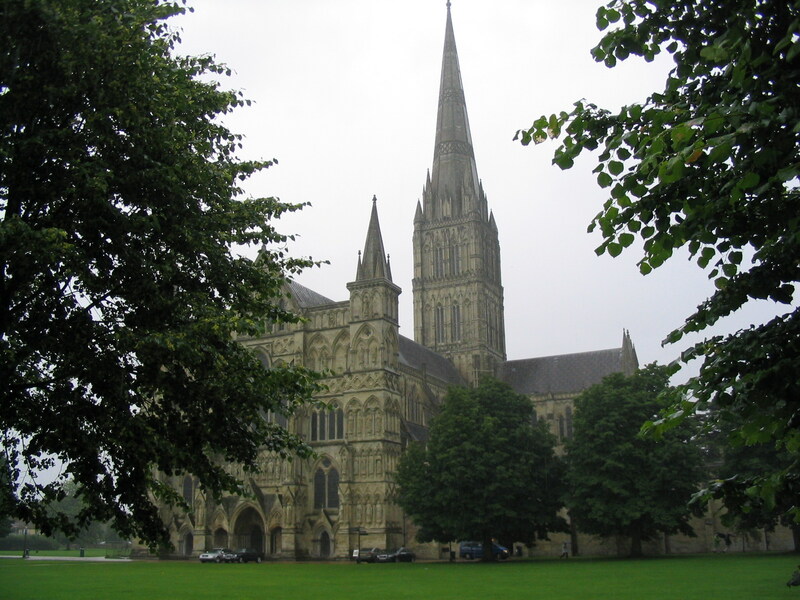 Following a packed lunch we drove the short distance to the beautiful small city of Salisbury. On the way there was a partial road closure due to a Spanish lorry having driven right off the road, through a hedge, over a ditch and 200 feet into a field. There was no obvious reason except probably that the driver was asleep at the wheel. You can see Salisbury Cathedral from miles away and it is easy to use it as a guide when looking for somewhere to park. The cathedral took exactly 100 years to build and has the tallest spire in the U.K. a distinction it reached when the even taller Lincoln Cathedral spire suffered from an Earthquake that reduced its height. The cathedral is situated in a lovely large green park and inside is finely decorated with statues, memorials, stained windows and not to mention the sheer beauty of the architecture with its fine Norman arches and vaulted ceiling. It is also the inspiration for the cathedral in the book and mini-series “Pillars of the Earth”. Part of the cathedral has on display the best preserved original Magna Carta document. It attracts visitors from all around the world and though is written in Latin, has a number of English translations nearby. It’s quite something to see and its writings became the basis for laws all around the world. By now it was mid-afternoon and we could smell rain in the air but we still found time for an unhurried walk around the pretty old streets of Salisbury before making our way back to the car though there was a lot more to see in the city if we wanted to. We took the back-streets towards London for as far as we could, driving through a number of pretty villages and passing through some wonderful scenery. My two guests had a wonderful day and so did I. This entry was posted in Culture, Travel, Ye Olde England Tours and tagged Culture, holiday, outdoors, Pillars of the earth, Private Tours, Salisbury, Stonehenge, Travel, UK, vacation, Wiltshire, Ye Olde England Tours. Bookmark the permalink. How nice 🙂 I can’t wait to see Stonehenge. There’s something about it being so ancient that is both comforting and awe inspiring; maybe it’s because I’m from the states. We used to be able to sit on the stones once in stonehenge. Is that still possible today? No it isn’t generally possible anymore. There is a metal railing that keeps everyone well away and a few staff keep an eye on everything. I think aside from the Druids there are only a few pre-paid and quite expensive packages that allow you to Ali inside the circle outside of normal hours but I don’t think you can sit on them any more.